Hello, and welcome to this edition of Whiteboard Wednesday. Today, I'm going to be talking about the best websites you can use to research law firms. One of the things that students always struggle with is to really understand what a law firm is like and what their strengths are. There is this view that all the law firms are the same - and when you're looking at it from the outside, it can seem like that. If you come to an open day or do a vacation scheme, you get a better idea, but if you are just searching the web, it can be quite difficult. So I just want to give you some pointers on some of the websites that you could use to research law firms effectively. So let's start with some of the student focus ones. I'm sure you've heard of some of these but this is a bit of a roundup of the ones that I think are quite useful for people in your position. So to start with, All About Law. I think All About Law is a really good all-rounder. It has good articles, it’s got jobs. If you sign up for emails, they'll give you really good job alerts. So I think All About Law is a good one to start with. Then you've got LawCareers.Net. It’s been around for a long time, some fantastic content on there, particularly the commercial question, and I think that's really useful. A lot of interviews, a lot of insights too. And again, similar to All About Law, really good in terms of emails, listing all the law firms and practice areas, deadlines, etc. Now, I think everyone has heard of Legal Cheek. Initially, a news site, and I think it's still predominantly is a news site, but they have a really good careers section on there. Some of the events are really starting to pick up and they do really good events with law firms. I think Legal Cheek is one that you should be looking at. It's also quite a funny read as well. You've also got Chambers Student. In terms of research and understanding the culture within a law firm, I think out of the student focused websites, that might be the best one, particularly this section, 'the true picture'. The way that they do this is they have journalists who will interview trainees, who will interview training principals, graduate recruitment partners etc who will then pull that information together into a really formative section on the website. So have a look at that, The True Picture. Then you've got Lawyer2B. Been around for a long time, got some good information on the commercial awareness section. Lex 100, another good one to look at. 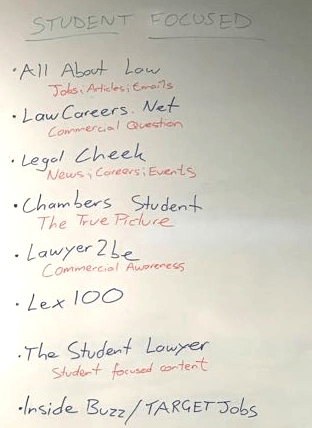 The Student Lawyer, not really that popular but it's good content on there and it's written by students, so it's student-focused content. And then you've also got TARGETJobs and Inside Buzz. TARGETJobs is not specifically legal but it has got a good legal section on there. TARGETJobs and Inside Buzz are the same company so it's worth looking at. Then for some law firms, they have really good and up to date graduate recruitment websites. Some do, some don't. But if you are looking for a particular firm, have a look at the graduate recruitment website as well because you could find there's a lot of really good information on there. But in terms of the student focused websites, I think that's a pretty good list. But what you also need to do is look at some of the legal industry websites because you'll get a lot of information which isn't student focus. This is often around training contract vacancies, trainee salaries, those kind of news stories, but you also need to take a higher level view. These are some of the websites that you can start to read. 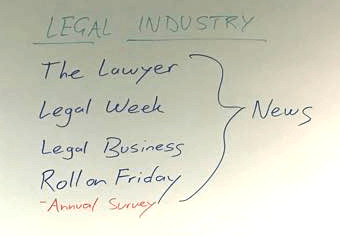 You've got The Lawyer, Legal Week, Legal Business. These will all be a really good source of news within the legal sector and the legal industry. Those are three websites that you should certainly be looking at every day, every other day. Then you've got RollonFriday. A little bit different, it's more tongue in cheek. But again, really good content on there. And if you're going to look at anything, try and look at the annual survey. They do this every year, and get a lot of feedback from trainees, partners, associates within law firms who will be really blunt and honest about what it's actually like. So in terms of understanding the culture, the annual survey is pretty good on RollonFriday. And then you've got some really good websites here. Chambers and Partners, Legal 500, IFLR - but not an exhaustive list. These websites will give you an idea of an individual law firm's strengths; strengths in practice areas and strength in regions. If you really want to begin to unpick a law firm and see what their strengths are, the things that you should be pulling out and putting in your training contract applications, these are really good websites to look at. So it will certainly show you the strengths of individual law firms. They'll often rank different practice groups in terms of tier 1, tier 2, tier 3, etc., tell you about some of the key lawyers within these practice groups as well. So really good information here. Now we've got some others which I've just picked out. There's a lot of information on YouTube, loads and loads of information on YouTube. 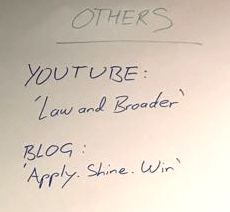 But I think there's one channel which I think is producing really good content and that's called "Law and Broader." So this is created by an associate at another law firm, and she provides a lot of information on training contract applications and it's really useful information. You should certainly be looking at that one. There's lots of blogs as well. You get blogs which are really well read for a short period of time if somebody is updating them. I think one of the key ones right now is called, "Apply.Shine.Win." That is written by a future trainee at another law firm who has recently gone through the training contract process, secured a training contract, and gives really honest information. I think in terms of understanding the process and what you need to do, it's a really good blog to read. Now, one of the things that you can do as well is set up Google Alerts. 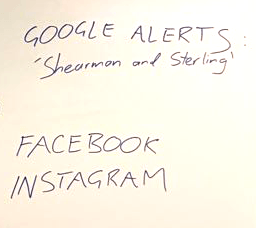 Let's say you were interested in Shearman, you could set up a Google Alert for Shearman & Sterling, and that would ping into your inbox every morning. Google will search the web, do a summary, and then send it to you. If you are looking at maybe 10, 20, 30 different law firms, it might be worth setting up some Google Alerts and they can just ping into your inbox every morning. That's a really easy way of having information sent to you. And then always look at Facebook because there's lots of information being pushed out through Facebook by different law firms at a graduate recruitment level but also a firm-wide level. So good information there. More and more law firms are looking at Instagram as well, I think more on the graduate recruitment side of things, but that's a really good way for you to get an understanding of what life is like. It's visual, photos, videos etc. If you want to understand the culture, some of the Instagram pages are very good. So I'd encourage you to look at that as well. Hopefully you've found this information useful. It's not an exhaustive list by any stretch, but I do think if you are looking at all of these resources, it will give you a good indication of the legal sector and the individual law firms that you're applying to. If you have any other comments or any other topics that you want us to cover on Whiteboard Wednesday, more than happy to do that. Just write them in the comments section, which is below this video, and I'll see you next time.